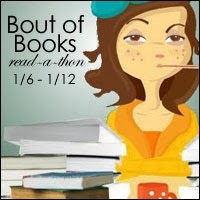 Bout of Books 9.0 starts tomorrow, January 6th and as much as I tried to be sensible and not join in this time (so much stuff on, guys), I can't resist a week of bookish delights. In fact, I'd like to see a bookish person who could resist. This time, instead of going a bit crazy daisy with the goals, I'm going to keep it relaxed and carefree. As reading should be. Kindle case is shamefully dirty...well used, even. So there we have it, a relaxed Bout of Books which will hopefully encourage me to finish at least one book (whoever thought it was a good idea to read multiple books simultaneously was wrong. Wait, that was me...). Are you joining in? What are your main goals? I'M SO EXCITED WHEE!! Going to keep this bout of books as relaxed as possible too because school and all, but it's always nice to get some reading done =) Have fun!